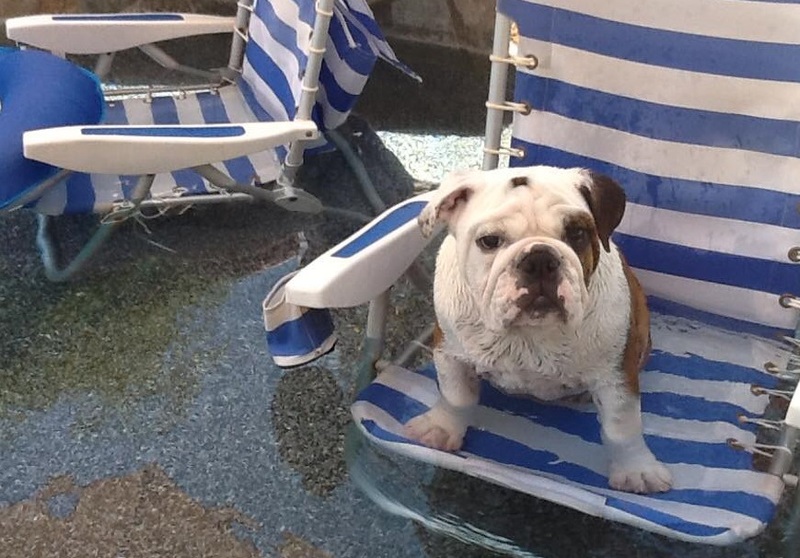 Keep your furry friend like Rocky here safe near the pool this summer! Photo courtesy of Joe Baldino. Skin damage. Make sure you know the signs your pet has been exposed to a corrosive chemical. As the list indicates, the sign that will be easiest for pet owners to see is skin damage. Pool chemical exposure could cause “red, raw skin” or blisters. If you suspect exposure, carefully examine your pet’s skin so that you can catch any damage right away. Ulcers. If your pet ingests a pool chemical, it can be very damaging. Banfield Pet Hospital warns that if your pet swallows any of these corrosive chemicals, they could cause ulcers in the “mouth, esophagus, stomach and intestinal tract.” They recommend seeing an emergency vet immediately if you think your pet has swallowed a chemical. Red, irritated eyes. 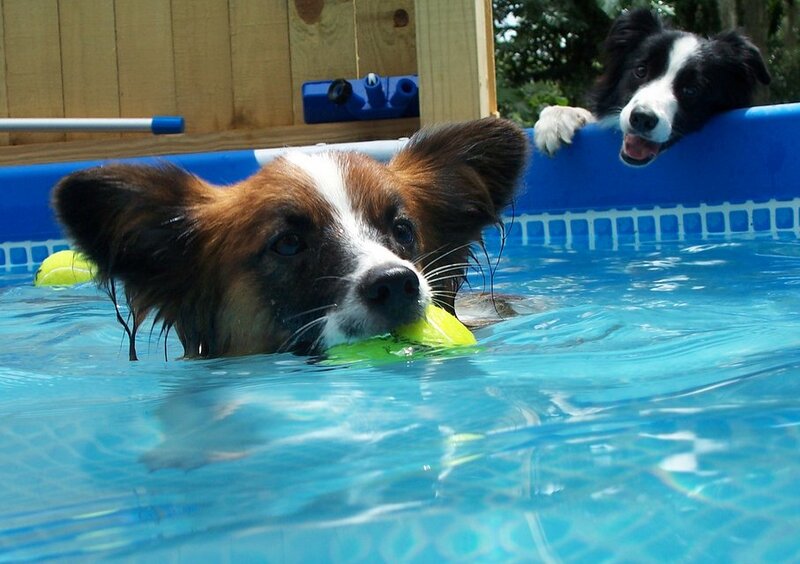 Many dogs love to swim as much has their human owners. And just as chlorine can irritate our eyes, it can irritate your dog’s eyes as well. While post-swim red eyes aren’t a sign of imminent danger, you should take steps to treat them. This article recommends washing out your dog’s eyes with fresh water or an eyewash solution in order to clear their eyes of any lingering chlorine. Irregular behavior. Pool chemicals can cause internal damage that you won’t be able to see, and because your dog won’t be able to tell you how they’re feeling, you’ll need to monitor their behavior. GlobalAnimal.org suggests that you keep an eye on your dog’s balance. If they aren’t walking normally, they could be reacting to an ingested chemical. Another behavioral change to be on the look out for is loss of appetite. Most dogs are always up for a meal or a treat—if your dog suddenly doesn’t want to eat, that could be a sign of trouble. One of the most important steps to take as a pet owner is to make sure pool chemicals are always stored securely. And be sure to follow the storage instructions for each specific chemical very closely. When you do, you can keep your pet safe and healthy all year long. Vee Cecil loves sharing her passion for wellness through her blog, My New Well. She is also a wellness coach, personal trainer, and bootcamp instructor who lives in Kentucky with her family. This entry was posted in Health and tagged dog health, dogs in water, keep my dog safe, summer safety tips, swimming dogs by jaqbennett. Bookmark the permalink. My Golden loves to drink pool water (although he doesn’t want to swim in it)….go figure? He is Only 9 mos. old I try very hard to keep him away from the pool drinking, but he seems to get to it quicker than I can catch him. How harmful is this to my baby? Thanks for your help. Angie, your dog may have a mineral deficiency and might need a kelp supplement. That may be one reason but it could be nothing at all. There are low levels of chlorine in tap water, too. Are you giving him tap or filtered water in his dish?